Eight teachers injured in school fight between four girls. Eight teachers have been injured trying to break up a high school fight. Eight teachers in a high school in the US have been injured trying to break up a fight between four girls in the school corridor. A video of the fight has gone viral. 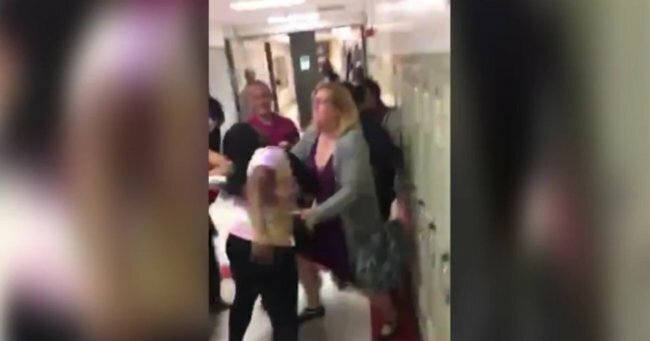 The girls throwing punches have been arrested, and those who filmed it are facing disciplinary measures at the school, Cheltenham High School in Pennsylvania. The scene is horrific: Two girls confront each other a school corridor. One is pushed, she pushes back. Two other girls join. It escalates drastically. They slam against the wall of lockers. There is pulling at clothes and arms swinging at heads. According to police, the fight began on Facebook. The video shows one teacher trying to intervene. Reportedly, she is a long-term substitute teacher and, before she can stop anything, she’s caught up in the fists. She is hit in the head and falls to the ground. She doesn’t get back up. The long-term substitute suffered concussion and was one of eight teachers injured in breaking up the fight. She was sent to hospital with three others, another with concussion and one with a dislocated shoulder. The girls are reportedly facing criminal charges, including aggravated assault, simple assault, recklessly endangering another person and conspiracy. Three of the girls, aged 15 and 16, have been taken to the Montgomery County Youth Centre, while the fourth girl, who is 18, is being charged as an adult.